Pumpkin Jack is back in town! A gravedigger by profession (squirrels burials are his specialty), he loves any kind of digging, and especially road deconstruction – the more bumpy and bothersome the better – and he couldn’t wait to see our guys digging up Route One and High Street here in the beautiful ‘burg of Hampton. He really digs the awesome monster pile of dirt in the municipal parking lot, too! You can find him hanging out with his magical poppets at Marelli’s Market, where he has a front row seat to the action, jealously eyeing cups of coffee and waiting for a chance to steal some candy. While it doesn’t look like it, this patriotic hobgoblin (who, it’s rumored, once spent a summer vacation with the Headless Horseman) loves to have his photo taken with humans. He’s Back! 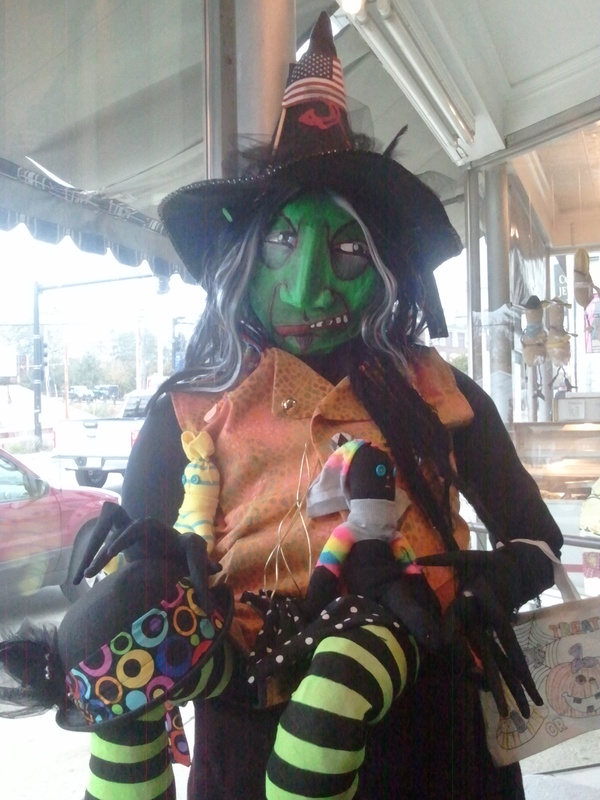 that squirrel burying, candy stealing, bundle of Halloween Hipness in the window of Marelli’s in Hampton. I am waiting to see the Headless Horseman make a visit one of these freaky fall evenings.